All of the following resources are reviewed by members of our Scientific & Medical Advisory Board, who are experts in the field from renowned organizations such as University of Pennsylvania, Memorial Sloan-Kettering Cancer Center, Virginia Mason Medical Center and more. Because of the philanthropy of generous friends, we are able to provide all of our resources and services to you, free of charge. To continue to offer free, comprehensive educational materials, we limit quantities of materials that can be ordered. If you run out of stock, you may order as often as needed. Materials shipped to United States and Canada only. Materials ship within 3 - 5 business days via UPS ground. 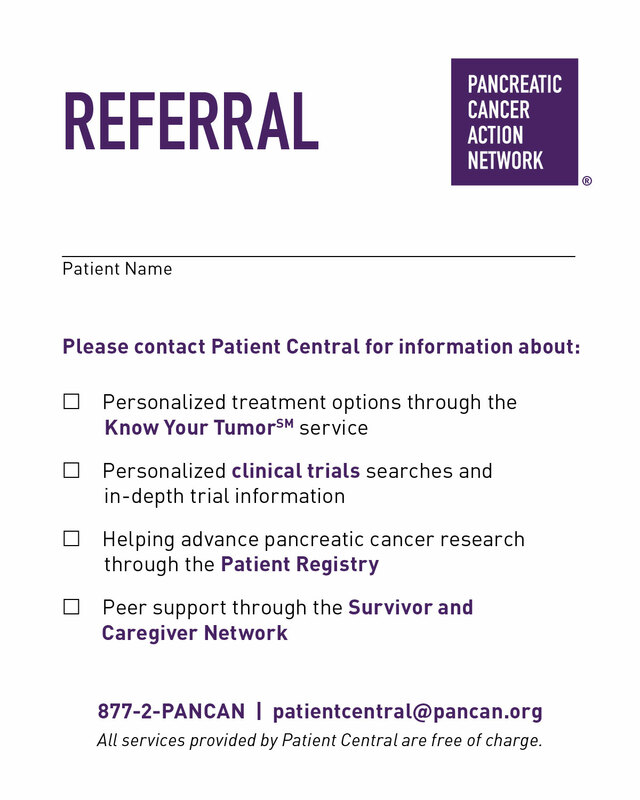 If you have questions or need assistance, please contact patientcentral@pancan.org. * How many NEW pancreatic cancer patients do you see in a month? By submitting this request, you will receive periodic updates and communications from the Pancreatic Cancer Action Network. You can change your subscription or unsubscribe at any time.